Optimized for a .22 caliber rifle, the second generation Mod 3 2-7×32 scope features the Riton Bullet Drop Compensated (BDC) Reticle. With Riton HD Glass, this riflescope is a great value for learning, training, hunting or target shooting. 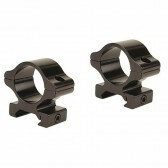 RIFLEMAN DETACHABLE RINGS - GLOSS, MEDIUM, 1"